The favourite children's entertainer's website. 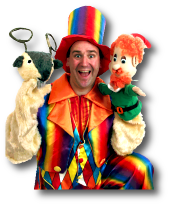 Despite the fact the children's entertainer is legendary for being the life of the party, in contrast to some cabaret stand-up comedians, the children's entertainer does not make fun of the audience, so has shows suitable for all ages from tiny tots to teenagers. 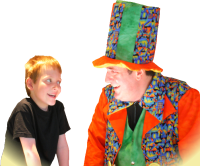 The children's entertainer, the multi-talented professional performer who's performance skills are so diverse they are listed here alphabetically making child's play out of the one stop shopping selection for your own combination of kid's entertainment producing a perfect party package, covers the UK with 30 years experience from entertaining children as far north as a roadshow disco in Fraserburgh Aberdeenshire, as far south as Punch and Judy in Brighton Sussex and thousands of venues in between for reasonable prices. Click on the links to the left of this page to source the children's entertainment combination that's conjured up for you.